The largest mid-19th century mother of pearl box we ever saw. This wonderful antique jewelry box is the largest of its kind that we ever had the pleasure of offering and it is inlaid with a diamond shape motif of abalone shell. This extremely stylish and all handcrafted box from the mid-1800s will look beautiful on any side table or vanity and if you collect antique boxes for their aesthetic beauty then it will look great in your display cabinet as well. To get a better visual idea of the size of this antique, we have placed a normal size mother of pearl spoonbox from the same era right next to this largest ever find (see image3). As you can see, there is a significant difference in width, depth and height. 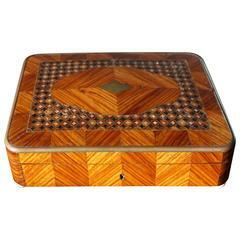 Inside this jewelry box (in image 12) you can see the mother of pearl cardcase that we sold last week. There are some old restaurations and there is a non working silver lock, but with no pieces missing, it opening and closing perfectly, with the striking, padded interior in Royal blue still intact, with the original velvet bottom and because of the extra large size, this box certainly is great value for money. It is difficult to get your head around how this mother of pearl box was made. Creating flat pieces of mother of pearl and cutting them perfectly and glueing them in perfect patterns onto wooden pannels and putting the box together with handcrafted, silver hinges and covering te rims on the inside with flat carved mother of pearl plaques and putting a small silver lock in exactly the right place etc. It is almost too much to take in and it must have taken an enormous amount of time to create this magnificent box. These boxes therefor were only affordable for the very, very well to do. And this largest mother of pearl box we ever saw, must have been too dear, even for some in the upper class. Finding this magnificent object more than made our day. This majestic box was made for keeping and showcasing ones most special jewelry such as bracelets, wrist watches, earrings, broches etc. Nowadays it could also be put on display for the rare and magnificent object that it is. Our price for this exceptional size, mother of pearl box includes perfect packing and also worldwide delivery from our store to your door in just 4 days. Maximum width x depth x height: 10 x 6.1 x 2.36 inches. We have a passion for the unique, for quality, for stylish yet practical and for craftsmanship of years gone by. Your purchases will be extremely well packaged and we look forward to serving you (again). You can shop all our 1000+ listings by pushing the button that reads 'View All From Seller'. Exquisite late 19th early 20th century trinket or jewelry box with purple silk lining. Price includes shipping to anywhere in the world. Shagreen, stained wood, and mother of pearl tabletop jewelry chest, stamped R&Y AUGOUSTI – LONDON, circa 1990. English Regency hinged tortoiseshell and pie shaped mother-of-pearl glove box, with brass oval inlays, a lined baize interior, and resting on raised brass ball feet, Mid-19th century. Large inlaid mother-of-pearl Syrian box.